Apparently, when Natasha Levinger does fanservice, she doesn’t mess around. Featuring Discord in an episode is enough to get Bronies excited, but she went all-out and brought in Maud as well. Awkwardness is to humor as dissonance is to music. Just in case you’re not familiar with the concept of musical dissonance, here’s some extremely fundamental music theory; intervals between notes can be broadly divided into 2 categories; consonant and dissonant. Consonant intervals are sometimes described as sounding “pleasant”, while dissonant intervals are described as sounding “unpleasant”, but that’s not quite accurate. It’s more that dissonant intervals produce tension. When we hear them, we want them to change to a consonant interval (technically, we’d say that the dissonant interval resolves to a consonant interval). To get a very basic example of this, listen to the first seven notes of a standard musical scale (so stop before the final note). Unless your musical ear is even worse than mine (which would be difficult), you’ll find that you really want that final note to sound (in other words, you want the seventh to resolve to an octave). You’ll also probably feel a certain catharsis and relief when the final pitch does sound. What saves it — indeed, what makes it the most celebrated line in the episode — is the awkwardness of the setup. Discord is tanking. He’s tanking hard. He’s tanking so hard that it’s painful to watch, because it is so damn awkward. We in the audience just wish something else would happen, so we could quit watching the poor guy fail. Maud is happy to oblige. 1) We’re just happy that the setup went somewhere, even if it was somewhere lame. At least we can stop watching Discord suffer. 2) Maud is so deadpan that the awkwardness just kind of dissipates. While everyone else in the shot is suffering through Discord’s routine, Maud simply gives no fucks — so when she becomes the focus of the scene, it becomes easier for the audience to give no fucks. We watch the awkwardness roll off Maud’s back, and it becomes easier to ignore it ourselves. This provides a sort of catharsis that makes the humor much more effective. The Cloudsdale Anthem Scene. Oh my god, The Cloudsdale Anthem Scene. This scene is so damn awkward that it is almost physically painful for me to watch. When I first watched it live, I actually had to mute the sound, because it was just that awful. I just wished something, anything else would happen. Much like her sister, Pinkie stepped up. Just like Maud, Pinkie’s “punchline” barely even qualifies as such. 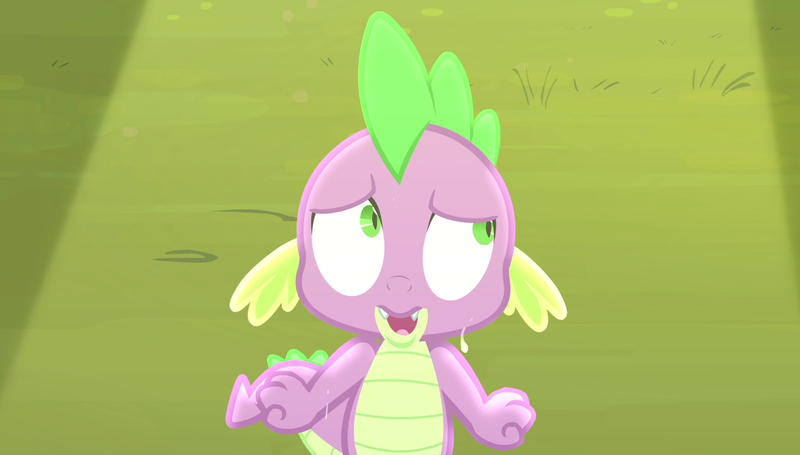 But it’s hilarious, because it provides a resolution to Spike’s extended failure. As is often the case, Pinkie fills the same role as Maud, but for the opposite reason. Where Maud is so deadpan that the awkwardness dissipates, Pinkie banishes it with her absurd enthusiasm. In both cases, the result is a hilarious catharsis. Of course, some works of comedy seem to use awkwardness for its own sake, rather than resolving it for the sake of catharsis (“The Office”, “The Guild”, etc.). These works sometimes find great success among a niche audience, but tend to be very “love-it-or-hate-it” affairs. So yes, I guess I am arguing that “The Office” is the humor equivalent of Black Sabbath. …Sometimes my mind is a weird place. This entry was posted in Analysis, Storytelling technique and tagged Cartoons, comedy, Discord, MLP5, My Little Pony, My Little Pony: Friendship is Magic, Spike, Storytelling. Bookmark the permalink. Uh, so Muad is like a zen master and Pikie is a living feedback loop of joy and Philla. I feel tempted to post your remark about Sabbath to /r/metal just to watch the carnage that would ensue.